Poke a small hole at the top of the tree, squeeze a drop of hot glue in the hole and push the end of your yarn into the hole. Since the top of these trees were flat, I covered the flat top surface with hot glue and in a swirl motion, starting in the middle where the end of the yarn is glued, worked my way out until the whole flat surface was covered. Begin by making a small vertical line of hot glue going down the tree about 1cm long. TIP: I used a pen to make a line down the tree so that the hot glue would always be applied in the same spot. This would act as the “back” of my tree, although with good coverage you will not see the hot glue. Once the small vertical line of hot glue is added begin wrapping the yarn around the tree, keeping the yarn tight and making sure the layers are close together. You will only get about 4-5 layers down until the hot glue dries. Pick off excess glue that was not used and has hardened. Repeat the vertical line of hot glue all the way down and continue wrapping the yarn around the tree. 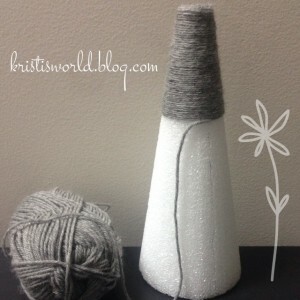 When you are ready to switch to your twine, hot glue your twine directly under your most recent layer of yarn. Then repeat wrapping the yarn around the tree so that the beginning of the twine is under the layers of yarn! This can get a little tricky: Once you are happy with the layers of yarn covering the beginning of twine, hot glue a straight line of yarn 1 inch (or how ever thick you would like your twine layer to be) down the pen mark you created in the beginning. This is going to keep the yarn intact and make for a clean transition for when you are ready to switch back to yarn! Once you have finished your twine layers, cut the end of your twine and hot glue it in a small diagonal. Then, pick up where you left off with your yarn and beginning wrapping the yarn around the tree, covering the diagonal line of twine (again, this makes for smooth transitions between materials so you can’t see where one material starts and the other ends). TIP: As you are wrapping your material around the tree, make sure you are creating that vertical line of hot glue down the pen mark you made every 4-5 layers of material to ensure a tightly wrapped tree! 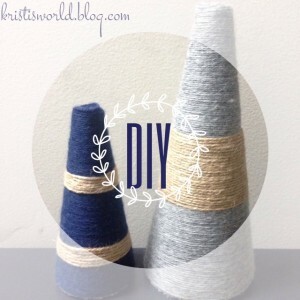 Get crafty, mix up the colors and materials! Try different shapes, add some other creative touches! I think I might add some cute lace to mine. Let me know how this worked out for you and if you make them, send me pictures!! !